across the bay. To relax, just stay on Nha Trang Beach. Other attractions include Po Nagar Temple, Long Son Pagoda, and the fishing harbor. 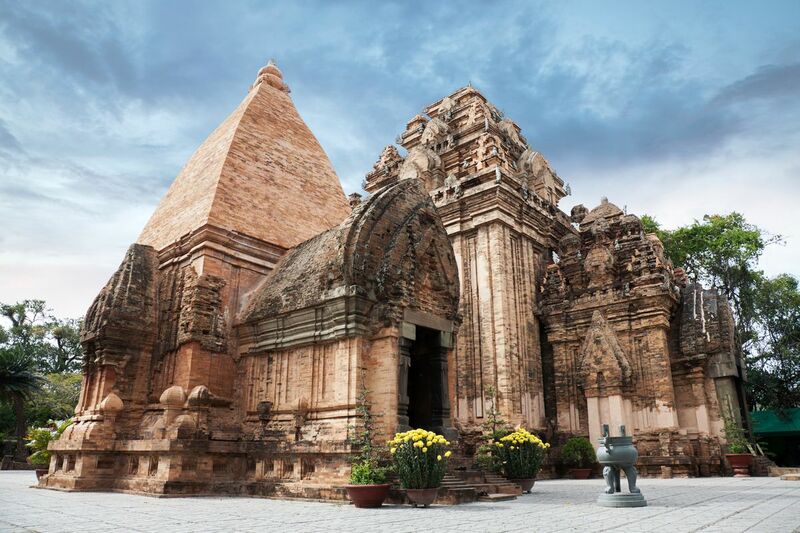 Nha Trang is a coastal city and it's a popular destination for Vietnamese families as well as international travelers. Fun fact: Diamond Bay Resort was the site of Miss Universe 2008. I loved the drove from the airport in Cam Ranh -- it was so green! You'll also see a lot of construction on the roads too. The population of the city is expected to grow in the next few years since it's still under development.The city is a great spot to check for everyone. There are number of resorts and hotels available for all budgets and you have activities for the outdoors -- water sports, hanging out at the beach, nightlife lovers -- clubs and bars, and for those who love local culture -- food, shopping. I went here by motorbike from North to South, i saw this lovely scene along the coast next by the wide road leading to city center of Nha Trang. The road is beautiful itself, plus the sightseeing of Ninh Van and Nha Trang bays which both along makes the trip a must-try. Get Local in Nha Trang! Feel the rhythm of daily life in Nha Trang! Enjoy the refreshing morning breeze as you take a relaxing scooter ride along the beachfront promenade. Visithistoric sites with a local university student who will share their cultural significance in the community. Dig deeper into Vietnamese culture and history as you chat with your guide during a street-side coffee break. Then head over to the market where the area residents shop, with its piles of tropical fruits, vegetables fresh from the fields, fish just off the boat, and an array of other local products. With your guide’s help, you may find yourself bargaining in Vietnamese! When you’ve finished shopping, take a seat in a local restaurant, where you will choose from the simple but delicious dishes favored by the Vietnamese. Best of all, you will be happy to know that Get Local supports not only local university students but also the charity school and orphanage at Loc Tho Pagoda (visits arranged upon request). Best way to spend the day trip here. After a cooling swim in the sea getting on a motorcycle ride seeing the sights was one of our best moves. If you get a chance to do this do it! They'll take you wherever you'll like to visit at your convenience. It was a fantastic group experience. This is one Vietnam's most popular seaside resorts. The ship arrived at the port with a number of locals marking our arrival. We had a wonderful time visiting various sites with a local tour. Beaches, crafts, restaurants and lots of shops with reasonable prices. Definitely go to see the sand dunes, and also make time to chill out on the beach. Rent a motor bike and drive around the hills for some great coastal views. Nha Trang is known as the beach-party capital of Vietnam, and, well, with all the booze-cruises, overpriced resort-lodging and semi-dodgy nightclubs, it earns that reputation. The beach could hardly be called clean, and the scene is far from salubrious, but so long as you don't stay out too late you likely won't get robbed, and it's otherwise good fun for a bender. The chief upside of Nha Trang is that Vietnam's best scuba-diving is located offshore, though I personally wouldn't be compelled to linger much beyond fulfilling that purpose.